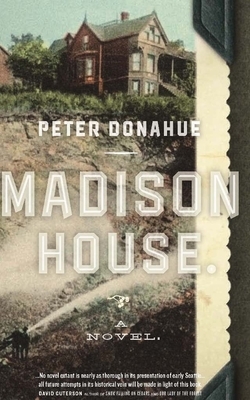 Peter Donahue's debut novel Madison House chronicles turn-of-the-century Seattle's explosive transformation from frontier outpost to major metropolis. Maddie Ingram, owner of Madison House, and her quirky and endearing boarders find their lives inextricably linked when the city decides to re-grade Denny Hill and the fate of Madison House hangs in the balance. Clyde Hunssler, Maddie's albino handyman and furtive love interest; James Colter, a muckraking black journalist who owns and publishes the Seattle Sentry newspaper; and Chiridah Simpson, an aspiring stage actress forced into prostitution and morphine addiction while working in the city's corrupt vaudeville theater, all call Madison House home. Had E.L. Doctorow and Charles Dickens met on the streets of Seattle, they couldn't have created a better book. PETER DONAHUE is an Associate Professor of English at Birmingham-Southern College. He is co-editor of the anthology Reading Seattle: The City in Prose and author of the short story collection The Cornelius Arms. His stories have appeared in over 25 literary magazines and his literary awards include first place in the OSU Short Fiction Award and two Pushcart nominations.